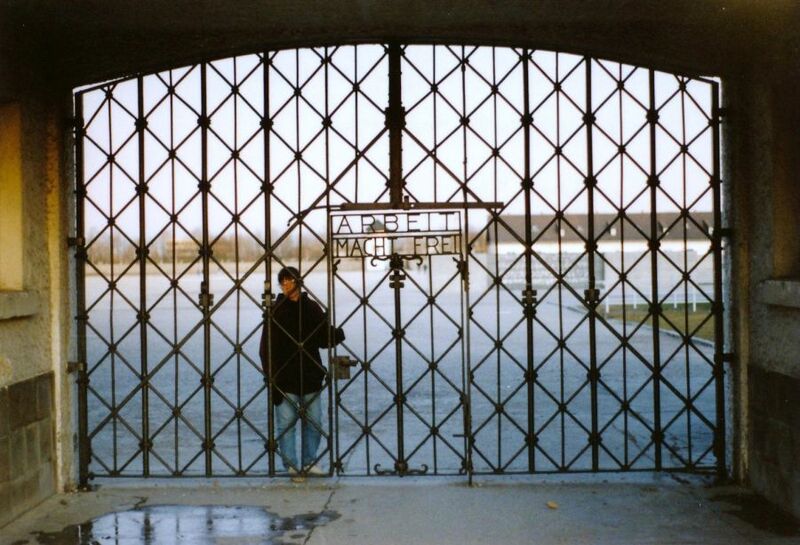 When I was 26, I visited the site of the World War II concentration camp in Dachau, Germany. I don’t usually visit war memorials or battle sites, but I was living in Germany at the time and felt compelled to visit at least one camp while I was there. During my travels, I’d seen signs all over Europe of the catastrophic damage done by the bombing although fifty years had passed. Europe has not forgotten the horrors of World War II, but I was afraid that Germany had. My German acquaintances were unwilling to talk at all about what had happened during the war. Any mention of Hitler resulted in a reference to “that crazy man” and an abrupt change of topic. I was worried that the suffering and horror were being ignored by the very people who had been duped into participating in it, so I went to see for myself one of the places where Jews, homosexuals, and many others were confined, abused, and killed by the Nazis. The compound at Dachau is still there, although most of the buildings have been razed to the ground, leaving only concrete curbs to mark the foundations of the barracks. 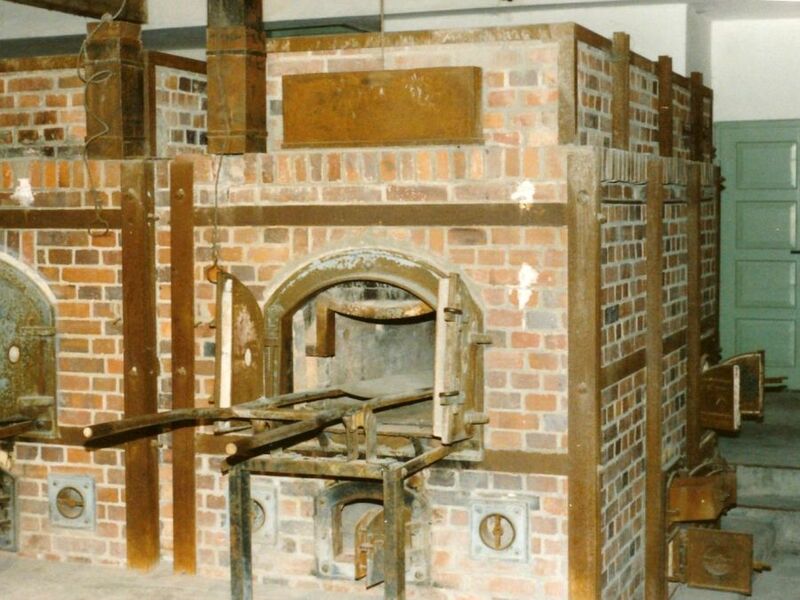 Critical landmarks are still there: the wrought-iron gate with the motto “Work makes you free” on it, the prison-style barb-wired fence, the door marked “Shower” that led to the gas chamber, and the brick ovens used to burn the bodies. The museum at the site proved to me that not all Germans were turning a blind eye to their history. I only remember two things about it now, but both are burned into my memory. One was a photograph of a pile of shoes. The cloth and leather shoes were tattered and crushed flat. The pile was the size of a haystack. It was just shoes, shoes of the victims of the gas chamber. No statistic or analogy got across to me the number of lives lost, let alone the number of lives affected, as that single photo did. The worn, dirty, discarded shoes were poignant symbols of destroyed lives. I cried when I saw it then, I cry just thinking about it now. The other photo was a picture of the camp officers. It came after the gallery of photos of the camp when it was in operation, of skeletal prisoners digging the pits they would be buried in. It came after the mountain of discarded shoes. It was like a class picture, a group of twenty men in uniform, only more informally arranged that you would expect from either the military or the Germans. The photo wasn’t very big. I leaned in close to look at the faces of the men who had overseen such horror and suffering. I saw boys — young men who looked so young it was hard to imagine that they were over 20. They could have been a group of students from my own college, members of a fraternity or sports team. Their eyes were bright and their smiles were warm, genuine. One young man was turned towards the others, laughing, as if someone had made a joke just before the picture was snapped. That was when the true horror of the holocaust hit me. Most of the men who hurt and killed millions of innocents were just people, like the boys I’d known in college. Ordinary, every day human beings. Somehow, they had come to do these terrible things to other humans. Their ability to feel compassion must have been dead. How else could they walk through the camp where they could see, hear, and smell the suffering of others, and continue to participate? The humbling lesson I took from Dachau is that there are monsters in the world and that in the right situation, I could be one of them. Even when people act like monsters, they are still human beings. They love and hate, dream and suffer, struggle and die, just like the rest of us. Remove our sense of compassion, and we are no longer human. Today over a thousand bloggers are posting about compassion and how it can change the world. In the month since I signed up to be part of 1000 Voices Speak for Compassion, I have been thinking about compassion, what it is, why it is valuable. The more I’ve thought about it, the more complex it seems, and the more difficult to cultivate. To achieve true compassion, we must overcome our tendencies to make assumptions about others, to judge others for any reason, to dismiss or minimize the trials another person faces, or to distance ourselves from the harsh realities of life. All these tendencies are strong in me and it takes awareness and effort to push them aside, open my heart, and just listen to what another has to say without criticizing or arguing. Most of all, compassion requires self-acceptance and humility. We have to look beyond another’s skin color, clothing, religious beliefs, political positions, and actions, and see a human being with experiences and emotions as rich and deep as our own. That is no small task. We all have value. We all have challenges. We all have weaknesses. We all need love and understanding. We must work to feel compassion for every member of the human race, or we open the door to misunderstanding, abuse, murder, terrorism, war, even genocide. It’s up to us. Believe me, it was not a normal activity for me at all! I had a hard time writing about it, too, but am glad I did. Thanks for your kind words. I’ve been to Auschwitz and Birkenau, and it’s a powerful and important visit to make. I studied Christian and Jewish theological responses to the Holocaust in my final year at university… And compassion for all sides, every part of the equation, was the most important lesson. Thanks for sharing that, Sara. That was definitely the feeling I got. I make a conscious effort to be compassionate and understanding in everything I do, and it is difficult sometimes (especially when I’m tired or hungry). The easiest way for me to maintain it is to remind myself that everyone is somebody’s son/daughter. That puts a human face on the person right away. I wish being compassionate came naturally to me. I hope that someday it will, but until then I keep trying. Btw, I’ve never been to a concentration camp, and while Schindler’s List makes me cry every time, the movie Lore actually brought home all of the horrors of WWII for me. I think it captured the way the participating Germans were brainwashed really well (and it made me cry, too). I love your suggestion: remember that everyone is someone’s son or daughter. When struggling to be kind to myself, I often think about what I would say to a friend or child in the same situation, and I always hit on a kinder message that when I just talk directly to myself. I haven’t had the nerve to watch Schindler’s List and haven’t heard of Lore, but I read the Diary of Anne Frank many times while growing up. I’ve been thinking of the scars WWII left, not just on the landscape or those alive at the time, but on the generations that followed. If they weren’t affected, my German friends would have been ready to talk about Hitler with me. They obviously still feel great shame over what happened, even though they weren’t personally responsible. I feel sorry for everyone who was involved and pray we don’t head down that road again even though it’s obvious we could: just look at the rage that Americans feel towards the Islamic extremists (and vice versa). I understand about Schindler’s List. It is heart wrenching. That’s also why I haven’t been able to read Diary of Anne Frank; I think the entire read would made me weepy which would be really emotionally draining. Would you agree, or should I give it a try anyway? I hate to refer to a comic book movie, but I think one of the best lines in the first Captain America movie is when Stanley Tucci’s character says that people always forget that the first country the Nazi’s invaded was Germany. Both sides of my family fought with the Confederates and that makes me feel shame even now, and that war has been over for a 150 years! Hard to say how long it will take for the scars for WWII, or any other war for that matter, to heal. Since The Diary of Anne Frank is a real journal, what’s most poignant about it is how human Anne is despite what is going on around her. For most of the journal, she and her family are in hiding in an attic, living a cramped and diminished life in fear. It just ends without graphic depictions of the horrors the Franks must have endured. There’s nothing about what happens beyond whatever historical notes added for clarification. I’m not sure why I found it so compelling when I was younger, although it may be the simple fact that throughout you sense the shadow she is living under, you know evil is just outside the door, and that sense of suspense makes you both sympathetic and empathetic, because death is waiting just outside the door for all of us. I love that quote from Captain America. It’s easy to dismiss “comic book” anything, because they can be shallow and childish. But many of the stories they tell are mythic, with important lessons for us to consider, even if the hero does wear tights.